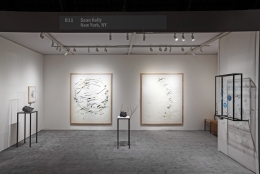 Sean Kelly is pleased to present a one-person exhibition of new sculptures and works on paper by Rebecca Horn at The Art Show, Booth B11. 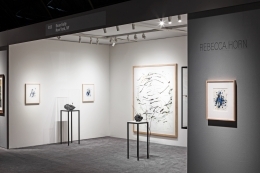 Since the beginning of the 1970s, Rebecca Horn has created one of the most important and distinct oeuvres in the world, encompassing groundbreaking performances, films, sculptural installations, poetry and, since the early 2000s, large paintings on paper known as the “Body Landscape” series. The works poetically embody Horn’s long held interests in science and alchemy, the rational and the intuitive, the immaterial and the sensual, the natural and the mechanical, the sacred and the profane. 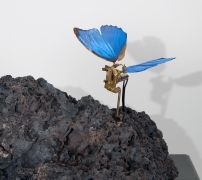 A highlight of the booth will be the sculpture entitled Metamorphose, in which an iridescent mechanized butterfly sitting atop a volcanic rock intermittently flaps its wings. 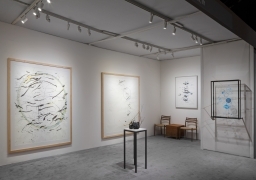 For more information on the fair, including opening hours, directions and ticketing information, please visitartdealers.org.